1 pc. 25,38 EUR ea. from 3 pcs. 22,90 EUR ea. from 10 pcs. 20,68 EUR ea. from 20 pcs. 19,60 EUR ea. from 40 pcs. 18,66 EUR ea. 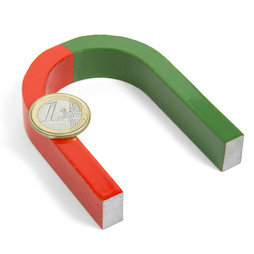 The AlNiCo horseshoe magnet is 80 mm x 60 mm big and red-green coated. The north pole is located on the red end. The horseshoe magnet is well packaged for shipping, the poles are short-circuited with a magnet keeper. These classic horseshoe magnets are popular in school experiments. 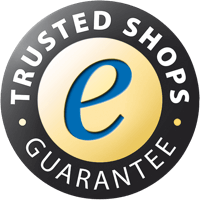 Almost all magnets on our website are made of NdFeB (neodymium iron boron). These horseshoe magnets are of a different material however, AlNiCo (aluminium nickel cobalt as well as iron). AlNiCo is better suitable for horseshoe magnets because it is less brittle and much more heat-resistant (up to approx. 450 degree Celsius). However, AlNiCo is approx. 8 times weaker than NdFeB, but still much stronger than a ferrite magnet (=refrigerator magnet). 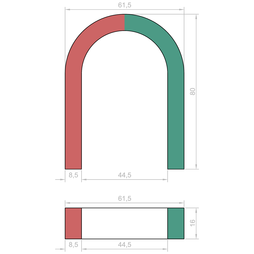 A NdFeB magnet in a horseshoe shape would break too easily and therefore is not produced in this material. 1 pc. 16,31 EUR ea. 1 pc. 26,00 EUR ea. The magnetic field of a horseshoe magnet can be well illustrated with iron filings. Caution: The horseshoe magnets are not evenly magnetised over the full length. Only the tip of the magnet has a clear north or south pole (see picture). Therefore, if you need a rather big and homogeneous field for your experiments in class, you are better off with two normal neodymium block magnets placed opposite from each other.